Do you use Twitter or should I say "Are you addicted in Twittering?" Well, how about earning money by answering Twitter messages? Earn as much as $2.50 per answer. I have tried answering Twitter messages since June 28 and each reply I receive $0.05. Not bad right? So here's how you're going to earn at least $ 0.05 per reply. You need to have a Dneero account. I will appreciate it if you will use my Dneero referral link. 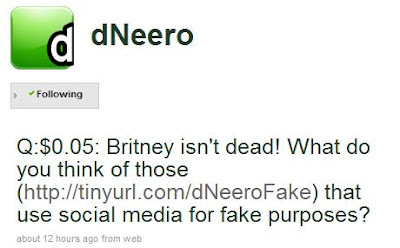 After that, go to the Dneero Twitter page and follow them. You can then start replying to their Twit messages. In your reply message start with "Q:$0.05:" then your message. Once you have submitted your reply, you will be notified by email that your answer is under review. At your Dneero account, go to the Your Account tab then click the See "All Twitter Questions You've Answered" link. All of your answered Twitter Questions will be displayed there including their status. In that same page, you can donate or claim your money. You need by the way a PayPal account to claim your money. Payout is scheduled when you reach $20. The complete instructions on how to earn money from answering Dneero Twitter Questions can be found on Dneero's Twitter page.